Fact: Married people consume more garlic than single people. Actually, I have no idea if that’s actually a fact, but it seems plausible that people looking to actively attract people will consume less of a food that actively repels people. There’s no way around it. Garlic can cause malodourous odours. The sulfurous fumes can come out in your breath, your gas, and even through your sweat. Luckily, the garlic-sweat phenomena has never happened to me, but I’ve heard of it, and, on at least one memorable hot day in July on a crowded TTC subway, I’ve smelled it. Oh I’ve smelled it. But, for all the stink, garlic is a wonder. It does so many things, and it’s one of the most useful and accessible medicinal foods to have in your house. Unlike some other medicinal foods, you don’t have to eat bowls and bowls or drink litres of the stuff. For garlic, a therapeutic dose (in order to achieve many of the benefits listed below) is about 3 cloves of garlic per day. Garlic has many interesting constituents, but the one that is likely responsible for most of the health benefits and has the most research on it, is allicin. Allicin is a sulfur compound that has antibacterial, antifungal, and anti-parasitic properties. Allicin gets released when garlic is chopped up, chewed, or otherwise mechanically broken down. Allicin also happens to be responsible for garlic’s spicy hot flavour. When garlic is cooked, the allicin content is diminished. Although it is less medicinal, garlic still has health benefits in its cooked state. Garlic is a high source of prebiotic fibres (otherwise known as fructooligosaccharides) that feed good bacteria in the gut. Please note that some people with compromised gut function can be sensitive to these types of fibres, (this is known as FODMAP sensitivity), so if this is you, proceed with caution. Garlic has been shown to have anticoagulant properties, which means it thins the blood, and therefore can ease blood flow and lower pressure levels . Ajoene, a compound found in garlic, has been shown to be effective against fighting fungal infections, such as “Athlete’s foot” . I have also heard anecdotal reports of people curing nail fungus with regular applications of raw garlic to the nail bed. An antimicrobial, antioxidant compound found in garlic called allixin has shown to inhibit tumour growth and cell mutation . 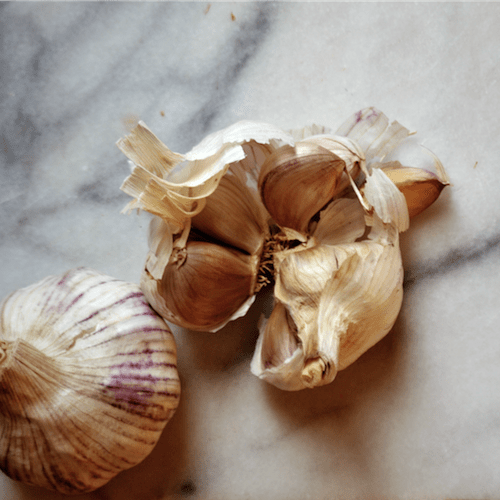 Aged garlic extract also appeared to increase natural killer cell counts (a marker of immune system strength) in patients with advanced cancer . In strict followers of Hinduism and Jainism, garlic is avoided because it is thought to stimulate sexual desires. Could this be due to garlic’s ability to stimulate blood flow? In Central European folklore, garlic was said to repel not only vampires, but werewolves and demons too. In the Philippines, garlic is said to repel monsters. In North America, chewing garlic is thought to repel terrible dates.